I’ve made no secret about my disdain for business cards. In an age where we can swap photographs and movies in a matter of seconds wirelessly, why are we still fumbling with clumsy pieces of paper that are both easy to lose and environmentally unfriendly? Today, it looks like I might be eating my words (or, as the case may be, yours). Enter MeatCards. 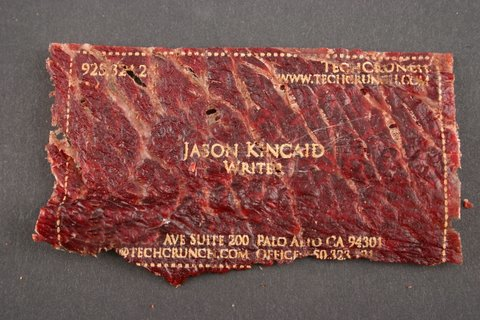 Two weeks ago a number of blogs caught wind of this bizarre and potentially amazing creation, bringing meat and lasers together to create the most protein-rich business cards ever. Some thought it was a hoax. But it’s very real. 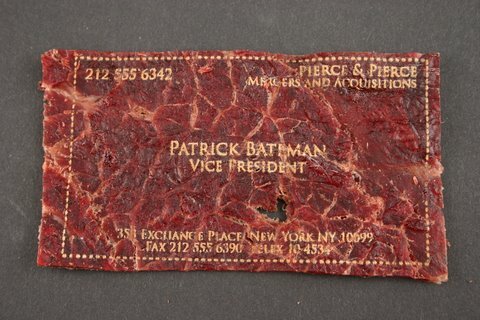 I reached out to the guys behind MeatCards, and as luck would have it they were preparing for their first run of prototype cards (styled after the design from American Psycho, of course). So I sent in my information, and they printed out the prototype seen above. In the interest of preserving a shred of privacy, I’m blurred out a few digits from my phone number, Email, and our mailing address. But most of the text, like my name and the TechCrunch information in the upper right hand corner, hasn’t been touched. Obviously the laser etching isn’t quite perfect, but it mostly gets the job done. More samples below. I haven’t receieved my MeatCards yet, and thus have been unable to taste the goods for myself. But I have been assured that they should in theory be edible, albeit with a strange laser-burnt aftertaste. That said, the guys behind MeatCards seem to be interested in finding a way to mark the cards with “Do Not Eat” to make it clear that they don’t want you to eat them – it just opens them up to too many possible legal problems and regulations. But they can’t stop you from doing it. So when can you order one for yourself? The product is still in the testing stages, but according to its homepage they should be going on sale some time soon. Make sure to check out this awesome Flickr set to see how it’s done. And for a more conventional business card, check out the cards Google is currently giving away.